Within the framework of our work on reconstruction of a history of a human civilization it is necessary to analyze closely «Slav–Arias Vedas», Santee Vedas of Perun, the Circle the First. To our regret, modern commentators of ancient knowledge have taken a great interest in the imaginations and have come off the validity. At all respect for their work, it is necessary to establish true and to correct the admitted mistakes. In Santee 1 it is told about how there was a meeting of the God–Father or the Father Heavenly earthmen – Perun, with children and descendants. I Perun Thundered, Svarog the son. According to our reconstruction of a history, the meeting occurred not earlier than VIII century BC in area of the city of Omsk at merge of the rivers Irij and Omi. A beautiful hypothesis will be date of carrying out of a meeting of God - Father Perun with people in 0 year of our era. Up to a flood of 1250 BC near Omsk there was city of Asgard Da’Arias. In city centre there was a pyramid in height of 700 meters. Asgard settled down on coast of the Ice cold sea, or the sea Da’Arias, or Scythian ocean - a low part of Western Siberia filled with sea water. Da’Arias it has been based Atlantis - by tribes Arias, headed it come from Russia - a dynasty of tsar of tsars of an antiquity. Atlantis there was on open spaces of the Volga region, and a capital of a civilization - in the Southern Volga region on coast of Caspian Sea. Atlantis existed on an interval of time 3506-1250 BC. Expansion Atlantis by the ground has led to creation of colony Da’Arias in the south of Western Siberia and Altai about 3000 BC. Some waves of a tsunami of 1250 BC. 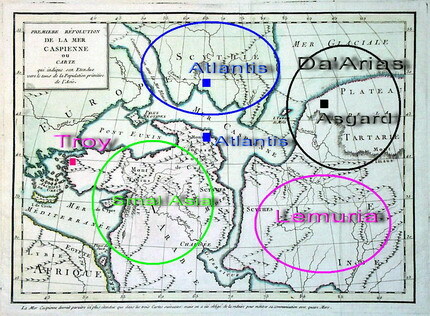 Have destroyed Atlantis and Da’Arias is together with their capitals. Cities have been destroyed by impact of water, construction crashed flooding, and the bases of constructions, walls and temples, including pyramids - are covered with a thick layer of clay and sedimentary breeds. Thickness of deposits now makes some tens meters. On a place of destroyed city of Asgard of Da’Arias city of Asgard Irij has been built up. It happened, when ocean water left from Western Siberia, and the sea-bottom has turned to tundra and has healed the wounds. Restoration of the nature lasted not less than 500 years from a Flood. Only in middle I of a millennium BC in Da’Arias people is descendant’s survived Da’Arias people and Atlantis people have returned. So, the meeting of the God - Father of earthmen Perun Thundered with people has taken place in city of Asgard Irij. According to text Vedas of Perun moves in space and an atmosphere on Vaitman. However it is not a spacecraft, and «the Chariot of the God ». Actually Vaitman it is the quantum object created by meditation of the pilot. The God, Prince or the person can create Vaitman or Vaitmar, according to the abilities. Size of Vaitman - about two meters in diameter that is Leonardo Da Vinci's sphere. Vaitman meditation Chariot of Kubara - « the Chariot of the God » allows to create. For convenience of moving in space and an atmosphere, the pilot uses a cocoon as eggs with the big aperture and sitting inside. In such Chariot of Kubara it is possible to place a cargo or even the passenger. Vaitman prepared people and magician can create. Larger Chariot of Kubara is Vaitmar. She can do during meditation Gods and Princess that is the most prepared pilots. In Vaitmar are located is 144 Vaitman or the passenger. The principle of action of Chariot of Kubara – Vaitman-Vaitmar for moving on the universe consists in de recoherence (disappearance) of object in a place of flying away and decoherence (restoration) - in a terminal point of travel. Moving is teleportation occurs instantly. So for flights in space of any spacecrafts in the usual sense this word is not required, and to construct spaceships it is not obviously possible from the technical point of view. Angels flying in the sky, a fragment of a fresco "Crucifixion" from Serbian orthodox monastery Visoki Dechani in Kosovo, Yugoslavia (the fresco is created about 1350). Let's return to text of Vedas. God - Father, is Perun tells to terrestrial children, that his Father is Svarog. There lives Perun on a planet the Paradise-ground in Svarga Heavenly near the city of Asgard Heavenly. In our usual understanding it is Paradise Heavenly in Kingdom Heavenly where the Hailstones Heavenly is located. I know the Knowledge of Gods is eternal. Our physical God - Father Perun son of Svarog and the Lada–God Mother, the grandson of God Vyshen - Sirs of God Lord. So direct physical communication between the founder of the universe – Sirs of God Lord, his child in our Galaxy - the Milky Way, Svarog and wife of Svarog - the Lada – God Mother, his grandson Perun, First children on the Earth the God - Father is traced: Tarh-Adam-Uranus and Container - Eva-Gays. Usual people, in turn, descendants Tarh and Container (Adam and Eva) and other children on the Earth God - Father Perun. First terrestrial children of Perun, we believe, that their twelve person, were born from seven his wives from female of Hominid, that is Homo sapiens. In Vedas these facts have found reflection in the god of the Rod and seven Beregin or on Greek manners Galaxies. And already terrestrial children of Perun, take in the wife numerous female Hominid, have created a population of mankind - Homo sapiens moralis. Depending on genie features Hominid, living in different parts of the world, four races of people - Europeans, Chinese, Negroes and Indians were formed. All Sorts of Race Great and Sorts Heavenly? God - Father Perun has told to the descendants the future of the Earth and a sort human. The sacred ground of Race Great. Will cover its White Raincoat. God - Father Perun in the remote past repeatedly visited the Earth, directing evolution of fauna with the purpose of reception of a sort Hominids, most confidants on the structure to the Father Heavenly. Our planet is an alive essence which on a regular basis loses orientation in a space because of presence of World Ocean and polar caps. The Earth makes fluctuations, with the period in some thousand years, changing the poles places and an inclination of an axis of rotation to a plane ecliptic, behaving as unstable gyroscope. About 13 thousand years ago planet has borrowed not so successful position in space that has caused the beginning of a glacial age. Perun in 7518 years ago has established the world in a star temple - that is has exposed the Earth in steady position when North Pole was in the geometrical center of Antarctica and has been directed to North Star - Tara. The South Pole planets settled down in area of island Elomir, that near to Greenland. Accordingly, Eurasia was in the Southern hemisphere, the Sun ascended in the West, and sat down in the East, therefore the West - east and the south - north were in other parts of the world. People have appeared on open spaces of the top Volga region, having created the first civilization - Atlantis (Antlan). For hundreds years up to a flood of 1250 BC climate of a planet began to vary, being prepared for new revolution of the Earth. It has brought winter in once fertile grounds of the Volga region - the rivers Ra. Children of Perun and their families - descendants of the Clan Heavenly have begun Great Resettlement through mountains Ripejskij - the Ural Mountains lay then in the West from the Volga region. Behind the Ural Mountains there was a Scythian ocean that is Da’Arias (Ice cold) sea on a place of modern West Siberian plain. The southern part of the sea Da’Arias incorporated to Caspian Sea, forming not so wide passage between the European Russia and east (western nowadays) a part of Western Siberia and Altai. There civilization Da’Arias with capital Asgard (near to Omsk) has been based. With a leather of color of a flame of Sacred Fire. Kapishe the Trident of the God of the Seas. to befog heads of leaders and priests. Great Laziness and desire another's will grasp reason of them. And Laws of the God - creator Uniform. Thus, Nij-Noah-Kronos has caused displacement of poles of the Earth because of what there was the huge tsunami which has destroyed Atlantis and its colony – Da’Arias. Cities Atlantis people and Da’Arias people were displace a stream of water, a building and a construction - are completely destroyed. On a place of settlements the multi meter sedimentary layer was formed of clay and sand. Works of art and ancient knowledge have been lost. Therefore Atlantis and Da’Arias have disappeared in abyss of Arctic Ocean, but have remained on a surface of the ground. At realization of scale and deep excavation it is possible to find out ancient artifacts of our ancestors. Survived people from Atlantis and Da’Arias have been compelled to move on "East" (nowadays the West) - to Asia Minor, Africa and India. Not-Beards people with a yellow leather through Pacific ocean have got to far America laying on "call" of the Sun. Also will study at them in many sciences. Then God - Father Perun has told to people about their near future which happens in me a millennium of our era. It has told about the Semitic people, becoming social parasite, and decided to grasp world authority. Come from the ground of God Nij. Also will be settled on all edges of the Midgard-ground. For they neither have no Spirit, nor Conscience. Will give his death martyr. The described events corresponds IV-XI to centuries of our era when in IV century Pharaoh Tuthmos III occupies the Volga region and Ancient Rome. In 355 his son Pharaoh Amenhotep will grasp 100,000 captives and will allocate them to Egypt, in 379 during the Outcome from Rome under management Moses-Arbat-Flavius Theodosius in Crimea Jews will build the Gold Taurus, and in April, 1010 in Constantinople there will be crucifixion by Jews God Jesus Christ Zlatoust. However Jesus Zlatoust prince of Russia and the Great Wanderer - Viking which will pass the legs across Eurasia, Japan, America, Australia and New Zealand, Southeast Asia, will create worldwide modern religions - it actually for 74 years of the life will bypass and will fly about all Earth set of times. The small Moon in Vedas are satellites of the Earth and orbital space station. As a result of a turn of the Earth in space and EMI (an electromagnetic impulse) all satellites will fall to the Earth. A new Flood covered a planet and World Ocean radioactive, chemical both oil waste products and products. Flashes on the Sun - Fire Heavenly, can aggravate and without that a sad condition of the nature of a planet. Fidelity and True is White Dog there is a representative of a sort of tsar of tsars of Russ. He is Grand Prince of All Russ, where All Russ it not simply Slav-Arias, but all sorts which have been given birth from Great Race - Russ. All Russ it both dynasty of Monomaches-Rurikovich, and Vikings, and Hashemite with Seeds, and Chingiz Khan’s, and Incas, and is representatives of Turkic, Japanese, Chinese and Indian sorts of Great Russ. Everywhere in the world descendants of Princes of All Russ are scattered. Other sections « Slav-Arias Vedas, Santee Vedas of Perun, the Circle the First » the future events concern to the far future. Our God - Father Perun, son of Svarog and the Lada-God Mother, the grandson Sirs of God Lord of the Kuba–Ra, has told to people, that it spoke about an interval of time on extent Svarog of the Circle and Ninety Nine Circles of the Life. Svarog the Circle makes the period is 25920 years, and Ninety Nine Circles of the Life is 14256 years. The general time period is equal 40176 years. Reference point is 7518 years ago when the world in a star temple has been established. The future is determined for 32658 years. Attempts to present business so what exactly now comes to an end a circle of 40176 years of a history of Slav-Arias - are ridiculous. To mankind of all hardly is more than 5500 years. Attempts to give out desirable for valid - are very dangerous and will lead to catastrophic consequences. People are in a stage of development of children of teenage age. We should live justly and to study more, and to not create to myself problems because of erroneous ideas of some commentators of Vedas. Atlantis and Da'Arias - the Medieval map of the Caspian pool in an antiquity up to a Flood of 1250 BC. WOW! All mythos of all time is pulled together here.....Arabic,Abrahamic,Greek,Celtic/Norse/Germanic & countless others. Like the (formerly) lost Tribe who wrote it just travelled about from time to time for the usual reasons(for want,lack of opportunity or persecution). mine own leaving Scythia via Tyrreah,travelling on past the Pillars of Hercules(Gibralta). Woww 144 layers of lightbody get's mentioned too.Nice crystal projection.